Alice L’écuyer: My school is beautiful. It may not be the most beautiful but it is mine. 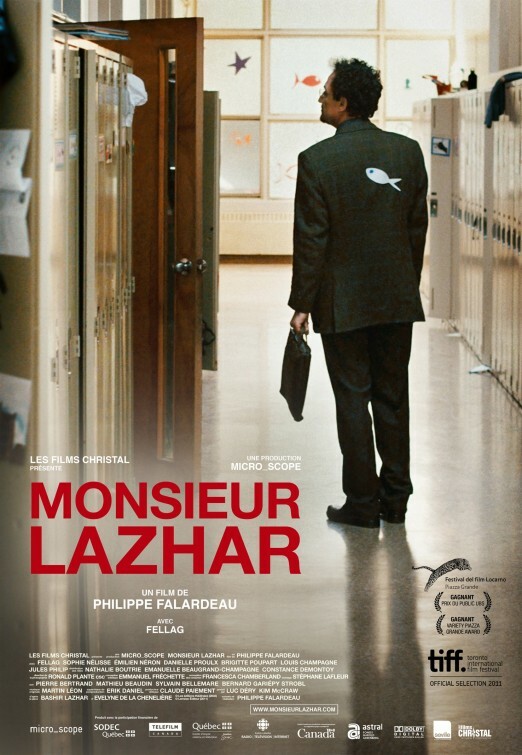 From the moment Quebecois filmmaker, Phillipe Falardeau, opens his latest work, MONSIEUR LAZHAR, on a playground filled with elementary school children scattered about in winter coats and accoutrements, it is clear that the potential for something wondrous is abundant. Falardeau then wastes no time in cutting to the film’s first of many defining moments, when a teacher we’ve never met is introduced to us hanging dead in her classroom, waiting to be found by the little innocent creatures that moments ago were playing in the courtyard, unaware. This bewildering act of desperation and violence is not only impossible to comprehend but it also makes MONSIEUR LAZHAR impossible to forget. The title character in Canada’s submission to the Oscars, played with a delicate balance of gentleness and roughness in a brilliant turn by Mohamed Fellag, enters these childrens’ lives as the replacement for their recently deceased teacher. A fresh coat of paint may not be enough to erase the image of a hanging body from the minds of these impressionable youths, but when a stranger from a strange land comes in and straightens all the desks and gives dictation from Balzac, they cannot help but face forward and pay attention. Only it isn’t as simple as a group of children coping with loss. Monsieur Lazhar is also dealing with his own grief, having fled Algeria after losing his entire family in an act of terrorism. And so he needs this class as much as they need him but they don’t know this and he isn’t willing to admit it. Falardeau is also smart enough to avoid being overly sentimental as well by positioning how difficult it is to be real with children in today’s hypersensitive society. How can you console a child when you cannot even legally hug them? The healing process, as difficult and as meandering as it can be, is the journey MONSIEUR LAZHAR takes its viewers on. Falardeau shows incredible patience and breadth as a filmmaker, which allows for some shockingly genuine moments of depth from the mostly pre-adolescent cast, especially leads Sophie Nélisse and Emilien Néron. He exhibits a great sense of style, control and awareness. He knows he is asking his audience to hurt alongside his characters, but he also knows that you will come out the other side feeling satisfied and relieved. You need only hold his hand to get there.